XML data can be used to influence almost any aspect of a Flash movie's operation dynamically - i.e. the presentation is configured when the movie runs, not when the project is programmed. Applications include on-line games, CD ROMs where some content must be kept up to date and networked applications where information must be passed between users. Flash gives the capability to parse, manipulate and extract information from XML documents through the use of the XML class and its associated classes. These make Flash a very powerful platform for programming with XML Actionscript 3 has a new XML-handling API which is even easier to use than that used in earlier versions (although AS2.0 classes can still be used). This handout will use the AS 3.0 classes, wrapped in a custom class for convenience and ease of reuse. 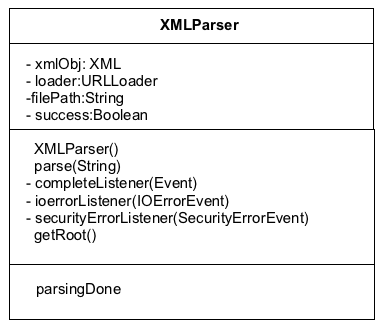 When an XML Document is parsed by an instance of the XML class, it is converted into a special, structured object-based data form. 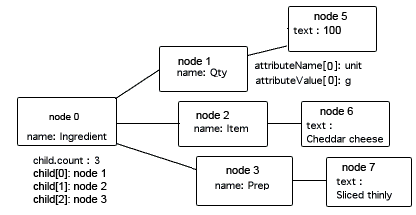 Each Tag is converted into one or more data objects called an XMLNode which has its own properties which can include a name, type, text and a list of any children it has. A Child of a Node corresponds to either a Tag which was contained in the original or the text of that tag. There are only 2 types of nodes that are created in Flash; elements which are non-text tags and text that are the text elements (i.e. the data content) of tags. We will incorporate this class into an image viewer application which will be based on the auto-slide example from the Working with Dynamic Assets tutorial. It will load images according to the filenames found in an XML configuration file (see Introduciton to XML tutorial). Copy all your files (i.e. auto_slideshow.fla, the images folder and AssetManager.as) from the auto-slideshow example into a new project folder. Open this file in Flash. Select File > New. Choose a new Actionscript File. Insert 10 frames at the beginning of the main timeline so that the main label is at frame 20. Move your preload script to frame 13 and the init label to frame 10. We now have to alter the code so that the names of the images to load and display are extracted from the XML data structure that has been generated from the configuration file. That’s it, your movie is finished. Test it by pressing the CONTROL and ENTER keys together. Create a custom dataType (i.e. an ActionScript class) that would hold all the information about each picture that is present in your xml file. Rewrite the code in frame 10 so that each time it finds a picture node, it creates an instance of your custom data class, fills it with data from the xml file and then stores it in an array. Rewrite the code in frame 20 so that as well as displaying the pictures, it also shows the title and comments for each image.